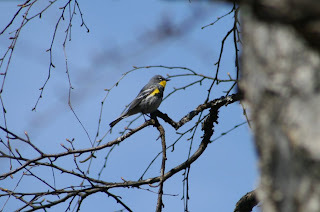 Rock Paper Lizard: Birding in Dogland: Yellow-rumped Warblers. 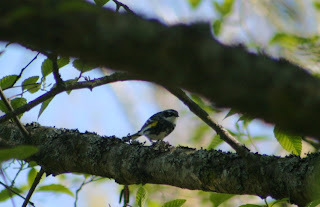 Birding in Dogland: Yellow-rumped Warblers. The birches that live fast and die young on this island are full of insects, and right now, are also full of Yellow-rumped Warblers. Most are from the "auduboni" group, the birds formerly known as Audubon's Warblers, identifiable in breeding season by their bright yellow throats and crowns. This group breeds throughout the southern half of the province, including Vancouver Island. During spring migration it is also possible to see members of the coronata group, formerly known as Myrtle Warblers, identifiable in breeding season by their white throats and eyebrows. These are birds mainly of the east of this continent, but do breed in British Columbia, almost exclusively north of 55 degrees North latitude. It is estimated that here in the Georgia Depression ecoprovince, the ratio of auduboni to coronata birds seen is about 3:1 (Campbell et al., 2001). I was having a difficult time photographing this bird (yesterday at Garden City Park). 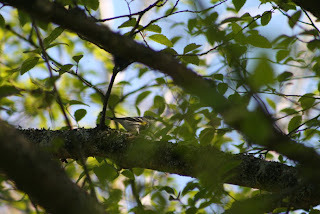 Not only was it being uncooperative, which is to say, a warbler, but a barky little terrier was nipping at my ankles as I was following the bird through the trees. What made it more ridiculous: the dog was still on its leash! It was on one of those leads that can be payed out about half a mile, and then, theoretically, reeled back in. The "owner" was a woman in an expensive-looking coat, standing a great distance away on a sidewalk, smoking a cigarette, unconcerned that her dog was running amok. I should have taken a picture of the dog too for the sake of this account, but that would have involved changing lenses whilst being attacked, which is always a pain. Campbell, R.W., N.K. Dawe, I. McTaggart-Cowan, J.M. Cooper, G.W. Kaiser, A.C. Stewart and M.C.E. McNall. 2001. The Birds of British Columbia. Vol. 4. UBC Press. Yellow Rumps turned up here yesterday. Oh, did I say, it's a Cairn Terrier we are getting ... but I won't let it dip at your heels ... or anyone's for that matter. You and the interpreter! CS: It was a Cairn Terrier (a white one). Mingus looks to be of much better breeding and temperment. Tres cute. Well with that dog at your heels, the first picture looks great when enlarged.